He’s king of the jungle, but not of the cinema. King Kong has remained dashing figure in the cinema. Traditionally, with the dazzling, sleek imagery of Fitzgerald’s era New York City – a city roaring in the scandalous revelries of the 1920s – as his backdrop, and accompanied by a beloved darling in distress, he swoons movie-goers. He fights, though his cause is lost, and dies as king, felled from his throne over a concrete jungle. He’s an American legend. And he’s captured audiences with a romanticism only a fallen god can muster. “Kong: Skull Island” (2017), directed by Jordan Vogt-Roberts, is set in the south pacific islands, late in the Vietnam War. Bill Randa (John Goodman), an eccentric preaching the existence of monsters, convinces the U.S. government to fund a trip to a lost island – “Skull Island” to be exact – under the guise that there’s some undiscovered phenomena in the soil. In reality, he’s on his own mission to prove that Kong exists. He recruits a former SAS officer, James Conrad (Tom Hiddleston), anti-Vietnam war photographer Mason Weaver (Brie Larson), and a troop of soldiers, led by Colonel Packard (Samuel Jackson). After dropping a deluge of explosives on Skull Island, the company quickly find themselves squaring off with a ten-story tall gorilla. The choppers attack, and an instant later, are swatted down, blazing. Most of their crews and passengers perish, and the few survivors are scattered in a jungle, holding to slim chances of survival. What follows is a sequence of mayhem and savagery, fueled by a politicized message. 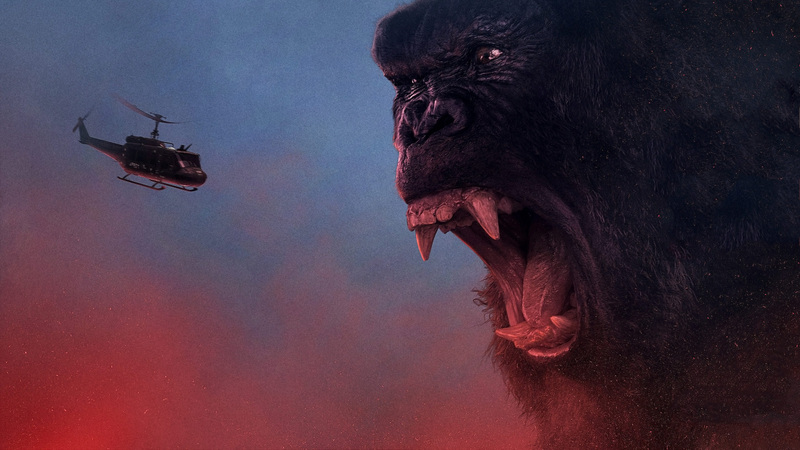 Instead of focusing on the terror and beauty and immensity of King Kong as a character, the film is weighed down with messages on environmental issues and critiques of the United States’ foreign conflicts. The magic of what could have been imaginative cinema is lost amidst the overt political messages; very un-magical, un-cinematic. U.S. soldiers are shown blasting rock music as they laughingly drop bombs onto local wildlife. They blanket trees and animals below in a hellish inferno of napalm. The men give little regard for the animals and creatures around them. It’s legitimately wrong on their behalf, but the film stresses this travesty too much; they sink a legitimate point, barraging audiences with rhetoric that man “doesn’t belong” – that earth isn’t his home. The bulk of the film’s negative commentary is focused on Col. Packard. Though he’s initially shown as a melancholy war hero, reminiscing over his old medals, as the film progresses, audiences find Packard to be a man desperate for any opportunity to fight, and to win – usually for the sake of fighting and winning. He takes the mission to the Island eagerly, and after his chopper attack fiasco, makes war on Kong, “king of the Island” – his newfound foe. He’s an embodiment what critics of America’s military stance would paint it as: insensitive, brutal, and itching for a fight. He shown as a war mongering, blood lusting killer, who won’t openly acknowledge the United States has lost, though in his stubbornness, he knows the conflict is nearly a communist victory. He’s a harsh caricature of the American soldier overseas. Kong is in fact a sort of guardian of the Island, keeping the inhabitants safe from creatures. Though Col. Packard is aware of this, he trudges forth on his foolhardy crusade, ignoring the ethical implications of eliminating the native’s only safeguard – a parallel to stances taken by American military personal in Vietnam. Col. Packard rallies his men, with a hint of painful bitterness at the United States’ failure in the aforementioned conflict, stating “this is a war we’re not gonna lose.” For him, it’s a final moment to win, to achieve victory, to conquer, to be a victorious hero. He drags his bedraggled troop on to a pointless battle – their demise; in the end, all but three are killed in a confrontation with Kong. Yes, “Kong: Skull Island” does illuminate possible issues America has created in conflicts past and the warhawk mindset so many unheedingly devote themselves to. But it does so in a way encumbered by the preachiness of the message; the constant references to America’s poor sense of ethical warfare in Vietnam and the gospel of man as inferior and dangerous to the world around him. I felt like they were essentially using most of the film to illuminate the United States’ failures in foreign conflicts more than anything. I got the impression that “Kong” wasn’t completely anti-war, but was trying to make a broader statement about the nature of man. It highlghts man’s violent nature, and how he tends to fear and show aggression towards that which he doesn’t understand, a theme congruent with the previous King Kong movies. Ironically, despite the anti-war veneer, the film subtly asserts that Kong only keeps peace through war. To protect the Island natives from the dangers of the lizard-like monsters that come from holes in the earth, Kong viciously fights the beasts constantly, as did his parents. He’s a sort of protector, a guardian. Yes, he’s king, but not a peaceful one; Kong rules through brute force and power. Rationalizing this point, I’m left with the conclusion that the film isn’t anti-war, but anti-unjust war. It protests unethical aspects warfare (bombing indiscriminately, disregarding collateral damage, intentionally ignoring civilian casualties, etc.) while subtly enforcing the truth that peace is often held only through conflict and battle. Sadly, the violence of the film felt more like a horror movie, a far cry from the glorious airplane duel over New York city seen in past adaptations. Viewers are trapped in a jungle of tasteless scenes of brutality, flashy explosions, and gruesome deaths. Characters are gored, torn, swallowed, and blown up. The violence doesn’t aid any significant character or plot development, and instead, is sprinkled randomly, catching audiences off guard, and leaving them wandering over their purpose to the plot. I’m not sure which I cringed more at – the disturbing nature of the scenes, or at their pointlessness. I was disappointed by “Kong.” The film ends with the characters escaping the island. There’s little resolve, and viewers are left with a plot that resembles the classic tale very little. The protagonist is unclear, and the story ends abruptly. The humans simply came, saw, and got conquered in a jungle. If it’s a prequel (there’s a hint to sequel films in a post-credit scene, so this could very well be the case), it could perhaps stand as a decent introduction. It made some legitimate points about the ethical issues of warfare, but in general, the plot is short and weak, and the action, cheap and nasty. As a standalone film, it pales to former adaptations. It never reaches the soaring heights and glory the past Kong has, nor does it stand as a culturally significant icon. He’s the biggest Kong yet, but I don’t think he’ll have the same prominence of the original king.